It is not often that I become excited about 'new product', but I must admit to having been very intrigued with the Ryobi One+ range of cordless power tools which all operate from the same 18v (1.7ah) battery. Now the fact that I am looking at a power tool rather than at a lathe or chuck and so on should not alarm anyone. The simple fact is that even in a 'turner's' workshop the majority of us use power tools, corded or battery operated for a variety of purposes and if we are not careful - and I have been guilty of this in the past - then we end up with a mishmash of items requiring different components, all of which take up a vast amount of precious space. I have used an angle grinder, cordless drill angled and normal, cordless and corded jigsaw, cordless circular saw - there are still things that I have to do around the house apart from turning - and battery-operated lights. The trouble with all of the cordless items is that they are all from different makers so the batteries are all different and some of the prices for a battery alone are £150 plus. The drill/driver is the one I use the most, mainly for sanding and driving in screws etc, and I use a cordless one because I don't like to risk leads getting tangled in work, as once happened. This one sports a 10mm keyless chuck, 24 torque settings, variable speed control and forward and reverse speeds. Its body is of high-impact plastic, and is sturdily built with soft-grip areas on the handle to reduce fatigue and vibration. I used the drill for both driving screws in faceplates and power sanding and found the unit to be very sturdy and not too heavy. 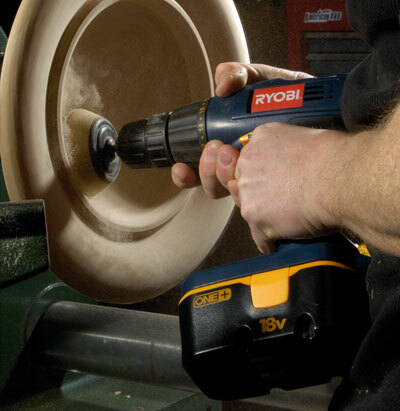 The drill withstood a severe test when used to repeatedly sand fissured timber, and the shaft and housing didn't rattle or have any play, making control nice and easy. The battery lasted a long while and was easy to change: just pinch the two side buttons on the battery and away it comes. The overall build quality surprised me to be honest as I would have expected the drill to cost a considerable amount more than it does for this level of quality. The fact that various types of workshop would benefit from having two or more of the available options from the Ryobi One+ range is attractive and keeps the charger and battery requirements to one kind only - an absolute boon as far as I'm concerned, with no more fumbling for the correct battery or charger. Is Ryobi leading the way in creating a sytem that caters for the diverse and various needs of the end user wishing to have quality tools at affordable prices? I would say that they are on to a real winner with this one and I will certainly be looking at some of the other items soon. "I would say that they are on to a real winner with this"